A dry white, as we've come to expect from Ostertag, this is a genuinely individual wine due to the characteristics of the Heissenberg vineyard; stony, mineral characters are very apparent here. 2009 was a hot vintage which goes some way to explaining the power and richness of this big Riesling. Built for the long term, the fruit is slightly hidden away at present but it's clearly there in abundance as is the generous texture, achieved in part by the barrel fermentation. A wine which will reward patience, drink from 2015 onwards. 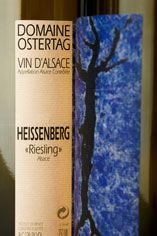 The Wine Advocate - A gorgeous nose of mint, thyme, and gentian in Ostertags 2009 Riesling Heissenberg seems to take on distillate-like form on an expansive, glycerin-rich palate, powerfully backed yet not swamped by 15% alcohol. Ripe peach and the piquancy of peach kernel complete the picture of a strong-finishing Riesling that I would drink over the next 5-7 years lest its alcohol eventually catch up to it. André Ostertag does not confine himself to the traditional Alsatian way of treating the varieties he has in his vineyards. Being a second generation wine-maker - his German family ('Ostertag' meaning 'Easter Day') founding the then 3ha estate in 1966 - André had evidently been put in his place by the elders; those looking askance at this Lycee Viticole de Beaune graduate and upstart who dared to put Pinot Gris in oak (despite the grape's Cote d'Or heritage). That was 1983, when his towering Muenchberg Pinot Gris was denied the honour to be labelled as such, becoming 'A360P' overnight, its grid-reference. 'Before' he smiles knowingly, 'I had to find my place, but I'm older now'. In 1998 he converted his 12.5 hectares to full biodynamic production. His “Vins de Pierre” label are terroir wines with a 20 year life depending on the vintage, and the vines in these vineyards represent this special link between earth and sky (and perhaps it is no wonder that the produce of which, grapes and wine, were believed by ancient Egyptians to possess divine qualities).The “Vins de Fruit” label (including Sylvaner VV and Pinot Blanc Barriques) blends fruit from across vineyards in a fruit forward expression and with a 5 - 7 years life . Ostertag treats Pinot Gris as the Burgundian grape that it is, rather than the sweeter versions of some producers - it is always the first grape he picks, only 10 days or so after the Burgundian vintage, because he wants a dry wine with no botrytis. 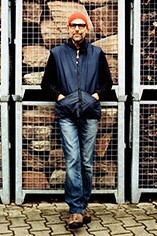 His use of oak on the Heissenberg Riesling may also challenge tradition, but is simply his response to the nature of the Heissenberg vineyard. The texture and length given to the Riesling by the oak acts as would brighter acidity. Rieslings and Pinot Gris from the Grand Cru Muenchberg are always majestic wines and magnificent to boot. His Sylvaner is in a different league from the usual dilute, overcropped wines made from this grape. His Pinot Blanc is fermented and matured for 9 months in barriques with lees stirring and malolactic fermentation, all of which contribute to its creamy softness. André's wines are works of art to be collected and celebrated. Riesling is the undisputed king of Alsace grapes, covering 22.5 percent of the vineyard area and producing some of the noblest and most age-worthy wines in the region, including Vendange Tardive, Sélection de Grains Nobles, and Grands Crus. 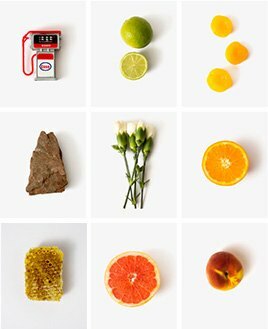 Dry, refined, and delicately fruity, it has an elegant bouquet of citrus fruit with mineral or floral notes. A typical mature Alsace Riesling is bone dry, with steely acidity and complex mineral and flint aromas. Like its German counterpart, it displays a superb definition of flavours, but with more concentration and alcohol. It thrives on schist, shale and slate soils that convey oily, petrolly, mineral aromas to the wine.